The bustling city of Bangkok offers something for everyone. 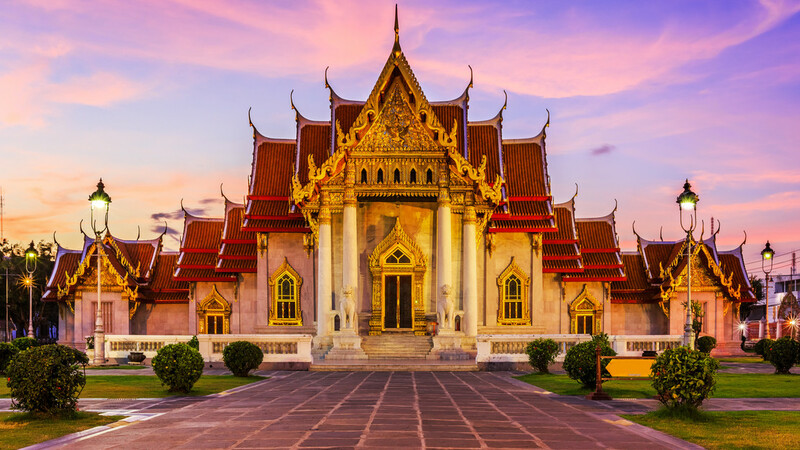 Discover ancient temples, a variety of shopping venues and fantastic nightspots during an incredible 3-star holiday in Thailand’s extraordinary capital. Discover the intoxicating sights, sounds, smells and tastes of Thailand’s thriving capital during a thrilling Bangkok holiday. Here are our top picks for an unforgettable 4-star holiday in this mesmerising metropolis. A sublime experience is waiting to be enjoyed during an exhilarating 5-star break in the thrilling city of Bangkok. Expect a feast for the senses during a luxurious holiday in Thailand’s spectacular capital city. Experience the energy of Bangkok with one of our exciting 3, 4 or 5-star holiday packages, which combine a stay in this exhilarating city with a break in one or more extraordinary destinations. There’s nowhere in the world quite like Bangkok. Thailand’s bustling capital city is arguably one of the world’s most vibrant and diverse cities. Bangkok is a city where futuristic skyscrapers, multi­story shopping malls and luxury hotels rub shoulders with ancient temples and beautiful palaces. Holidays to Bangkok offer something for everyone, from romantic getaways to exciting family breaks. Visitors to this sprawling metropolis will discover an endless list of attractions, including luxury malls, traditional markets and fantastic nightlife spots. One characteristic that sets Bangkok apart from long haul city breaks is its unique mix of old and new. Parts of Bangkok are exceptionally modern, whilst other districts give an account of Thailand’s rich history and Buddhist culture. Among Bangkok’s most famous historical monuments is The Grand Palace. The awe­ inspiring structure, built back in 1782 under the order of King Rama I, is an outstanding example of Thai architecture. Golden sculptures, ornate temples and beautifully crafted statues are just some of the features that surround this spectacular 53­acre royal residence. Within the palace grounds, which are open to the public, is Wat Phra Kaew, better known as the Temple of the Emerald Buddha. The temple is considered to be the most sacred site in all of Thailand. The Buddha itself, carved from a single block of jade, can be seen meditating. A short while away from The Grand Palace is Wat Arun, otherwise known as the Temple of Dawn. 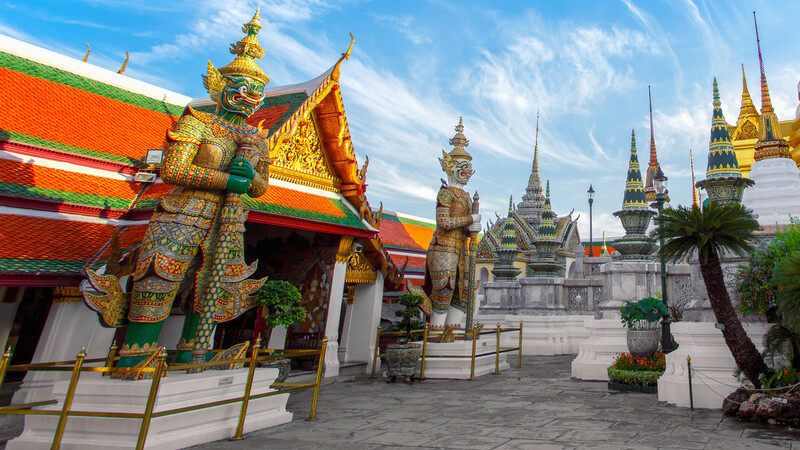 The iconic temple is located next to the riverbank of Bangkok’s scenic waterway in Chao Phraya and is one of the region’s most well known landmarks. The 67­metre high temple is often featured on the cover of nearly every Bangkok city guide. Another must-­see on the city’s list of attractions is the Chatuchak Weekend Market. This enormous labyrinth of stalls is filled with authentic delights, from handmade home decorations to fragrant street food. Those looking to partake in a little luxury shopping will want to pay a visit to the breathtaking MBK Center. The eight­ storey mall has approximately 2000 shops. The Central World mall is also a worthwhile destination for luxury shopping. Topping off the list of Bangkok’s main highlights is the city’s superb nightlife scene. The city is home to a multitude of clubs, bars and entertainment venues. Thailand’s nightlife has gained an international reputation and nowhere is it more apparent than in Bangkok, from the raucous streets of Khao San Road to the red neon lights of Patpong. 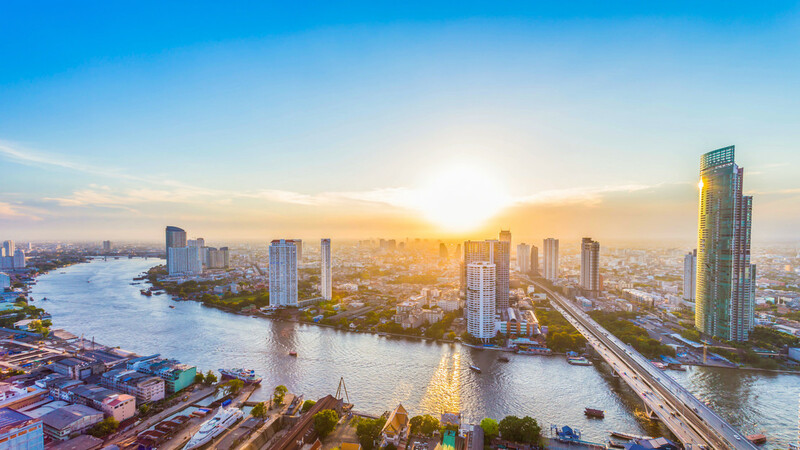 Bangkok, like the rest of Thailand, enjoys a tropical climate, with temperatures ranging between the early twenties to high thirties at any one time. Being a busy city, Bangkok can feel more humid than other resorts. Easter to early summer is when the city experiences its hottest weather. The monsoon, or rainy season, lasts from July to October. The weather still stays warm around this time. November to March is considered Bangkok’s high season.